Far Cry 4 seems to be pulling the same maneuver that Far Cry 3 did, and that’s keep the main antagonist from us. 3’s Vaas was great, he was intriguing, and psychotic. By far the best part of the game, and we saw him so infrequently and then sadly did away with him half way through the game. Far Cry 4 gives us an amazing introduction to the new world Kyrat, and to our antagonist Pagan Min, the reclusive glorious leader of the region. And like the Far Cry predecessor, it appears that they enjoy keeping the antagonist from us. We get introduced at the start, a reminder half way through, and then a final interaction at the end where we’re given a choice in Pagan Min’s fate. Throughout the game we’re graced with voice messages from Min, as he checks in on us during our journey, but these aren’t enough. The character is so weird and intriguing, we’re driven through the game to get as many interactions as possible with Min. But he’s kept from us, as we’re left with the squabbling pair of Golden Path leaders, and told Min is the bad guy. Is it the absence of these antagonists that make them so appealing? Would more interactions or appearances ruin their fascination? Or is it that all the work is put into their introduction, that the antagonist’s character isn’t actually as fleshed out as we think? As I slowly wrap up Far Cry 4, I also have Assassin’s Creed Chronicles: China, the first of 3 2.5 D side-scrolling action/platform games. Assassin’s Creed IV: Blag Flag also calls out to me from time to time, and Shadow of Mordor is eager to be played. I can only handle so many of the 3rd person genre games at once. Far Cry and Assassin’s Creed need to be wrapped so that I can get to Shadow of Mordor all before mid June when Batman Arkham Knight is released. I’m really upset that I’ve waited so long on Shadow of Mordor, because in May the Game of The Year edition is getting released. All the while I’ve been sitting on the original unopened. I’ve also picked up State of Decay: Year One Edition. I think I’ll start this game this weekend if I find the time and I’ll be streaming it full-time. I recently completed Call of Duty: Ghosts, and NHL 15, and I’ve been playing Rayman Legends and Worms in co-op on Twitch. Lastly I’ve just about wrapped up Sniper Elite III in co-op (finally). Ghosts and Sniper Elite III reviews are around the corner, and I’ll be jumping into Tales from the Borderlands, Episode 2 soon. I think that wraps up everything for this week. So I’ve definitely gotta get focused on serious gaming to catch up. Keep an eye out for the iReview of Ghosts tomorrow, and Achievement of the Month this weekend. 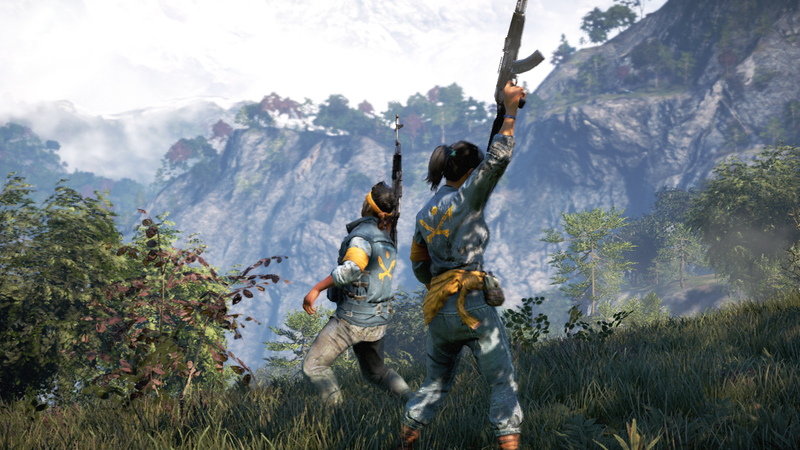 I’ve also got some new Far Cry 4 screenshots to add. Game night is Friday as well, and I’ll probably be up on Twitch: twitch.tv/irogans for that, 8PM Pacific. Come hang out. Arkham Knight (June), Mad Max (September), Metal Gear Solid V: The Phantom Pain (September) and Star Wars Battlefront (November) on the horizon all have me excited. And Wolfenstein: The Old Blood is also just a week away. This entry was posted in What Im Playing and tagged Far Cry 3, Far Cry 4, Kyrat, Pagan Min, State of Decay, Vaas. Bookmark the permalink.